Not long ago, we introduced you to our new dental care routine for Shiner courtesy of TropiClean dental health products for pets. I desperately need an easy non-invasive solution to Shiner's dental health and care that neither of us will struggle with. Of course, I still feel like brushing her teeth is important but honestly I just can't do it as much as I should or as much as she might let me. 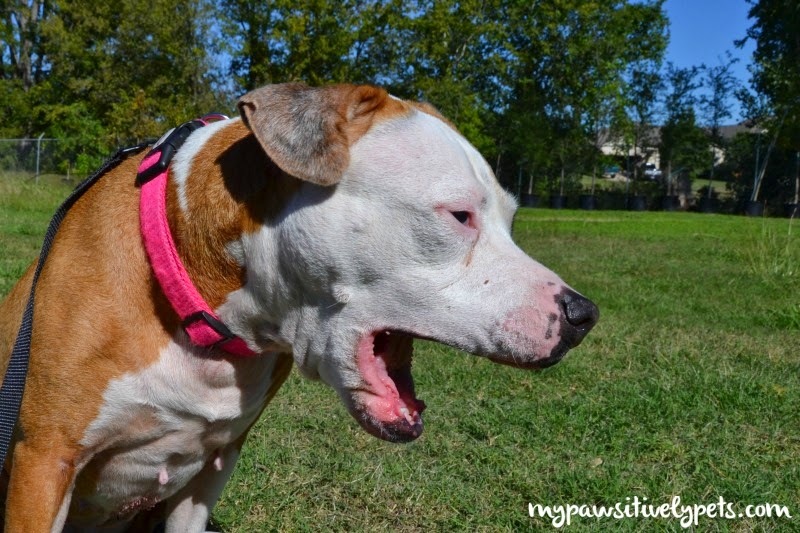 So why is pet dental health important anyways? Well, if you never brushed, flossed, or even gargled a little mouthwash for days, weeks, or even years how do you think your mouth would feel or smell? Gross to think about, isn't it? 80% of dogs show signs of periodontal disease by the age of 3. That's pretty young and it's a sign that many pet parents probably don't properly care for their pets teeth like they should. Left untreated, bacteria from oral disease can seep into the bloodstream and cause serious health risks. Did you know that bad breath is one of the first signs or oral disease in pets? Dental health is at the core of your dog's overall health. Before we started using our TropiClean products, I noticed Shiner had some stinky breath. I had been forgetting to brush her teeth regularly... Since we've been using them, I can't say that I've had one of those "Oh my, what stinky breath you have!" moments with her. One of my favorite products is the TropiClean Clean Teeth Gel. We've actually used this product in the past and liked it. This gel does not require a toothbrush, but I like that you can use one with it if you want to. Sometimes I use the TropiClean Clean Teeth Gel with a toothbrush, and sometimes I don't. Apply the gel to the surface of your dog's teeth. (I like to use my finger and/or toothbrush.) The gel will soften and remove plaque and tartar over time. TropiClean Clean Teeth Gel works fast and naturally to help reduce plaque and tartar over time - NO toothbrush is required for it to work. It's made with a proprietary blend of natural, holistic ingredients that produce a healthy oral environment. 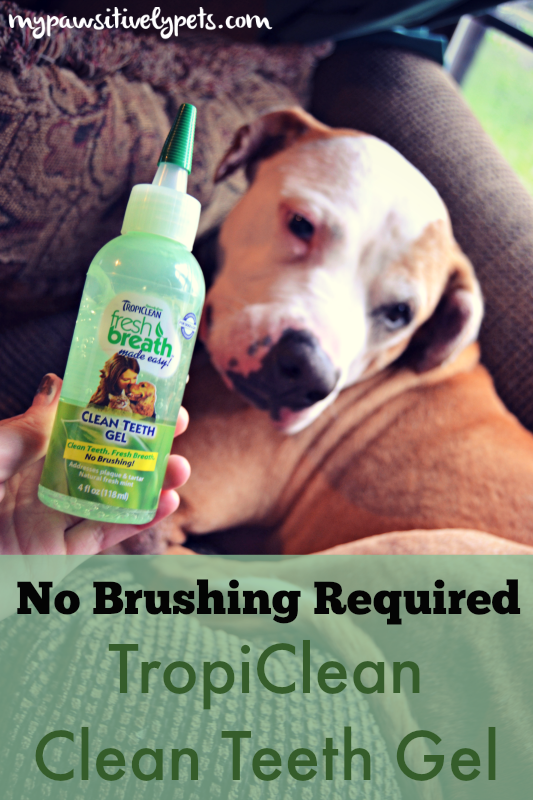 TropiClean Clean Teeth Gel kills the germs in your dog's mouth that cause gingivitis, plaque, and bad breath. 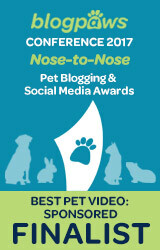 Will help your pet have clean teeth and "up close" fresh breath everyday! More kisses for both of you without the yuck factor. 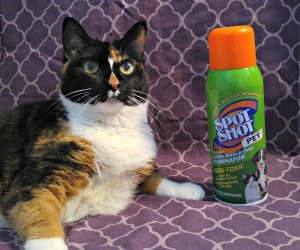 OK, I'll let you use this stuff on me. And what does Shiner think of the TropiClean Clean Teeth Gel? She tolerates it more than having her teeth brushed for sure. It's easy for me to apply too. So far, I haven't come across any issues while using this product and I do believe it's helping to keep her breath nice and fresh. From the very beginning, TropiClean has been passionate about creating natural and healthy products for pets. 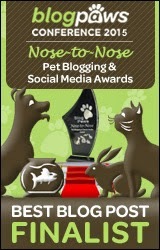 Stay tuned, as we will be sharing our experience with more TropiClean dental health pet products in a few weeks. You can follow TropiClean on Facebook and Twitter to stay up to date with them. What does your dog think of having their teeth brushed? Do you think they would tolerate the TropiClean Clean Teeth Gel? We don't like having our teefs cleaned, but the last time I was at the vet, she mentioned to the mom that my teefs really need to be brushed. This looks like a good alternative. We'll check it out. Thanks for the review. They do make some for kitties too! Ahhh this sounds fabulous Ann! Does it have a beefy smell or anything to entice the dog? Titan doesn't really mind me brushing his teeth now but I have to do it in spurts or he gets annoyed. It does not, Bren. It smells minty and fresh, kind of like human toothpaste might smell. 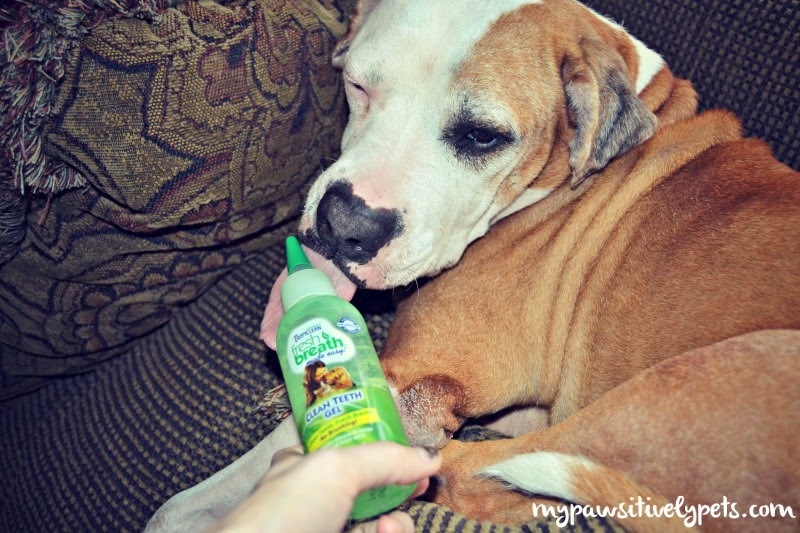 MomFOD has used this stuff on our dog! Not on me, though. I have fresh breath already. - Crepes. Now that sounds pretty darn interesting! I think it's definitely worth a try because none of mine will let me brush their teeth! Fish eating is why my breath stinks—or so TW claims but she’s never smelled her own. Wonder if that’s like the Ark Naturals dental stuff for dogs and cats. Aunt Karen says it really works. Wow, that stuff sounds pretty great -- what a good alternative if your pets don't tolerate brushing! We have that stuff, got it in swag a while back. Never thought to try it onthe cats without a brush - great idea! Just ordered the brush kit through Chewy - I've really got to get more diligent when it comes to brushing Harley's teeth. Thanks of r reinforcing my thoughts!